Seabourn have perfected their famous veranda suite. 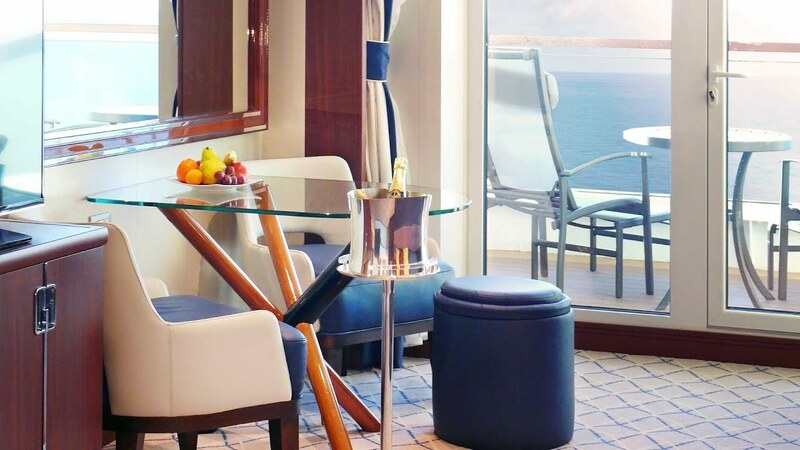 The Seabourn Ovation Veranda Suite was designed by Adam D. Tihany and has an elegant, nautical vibe. Plus there is a wonderful veranda for enjoying the ever-changing view. The Seabourn Ovation Veranda Suite is the most popular type of accommodation onboard and it’s easy to see why. Every suite is bursting with luxurious finishes and subtle designer touches, as well as an extra-deep veranda. Check out our full Seabourn Ovation review. See how it compares to the older Seabourn Odyssey Veranda Suite. Read our review of the Seabourn Encore Veranda Suite. The layout is similar to the suites onboard Seabourn’s earlier Odyssey-class vessels. In fact the size is identical, the real difference is in the design by Adam D. Tihany. He has softened the look by replacing the sharp Nordic lines with gentle curves as well as a subtle palette of blues and creams. Tihany offsets this with dark timber highlights and gleaming chrome accents. These spacious suites are all located forward and midship over seven passenger decks. Also, they are located well away from the dining and entertainment areas so are always quite. A gracious stewardess services the suite twice daily. Also, she makes sure you always have fresh fruit and that you never run out of bath products. In addition guests can choose from a selection of bathroom amenities, including hypoallergenic products. There is also an extensive pillow menu. The Seabourn Ovation Veranda Suites are the same size as those on all the other luxury Seabourn ships. Each one has 28 sq. m. / 302 sq. ft. of internal space, in addition to a veranda measuring 6-7 sq. m. / 68-83 sq. ft. The Seabourn Ovation Veranda Suite layout. The layout of the Seabourn Ovation Veranda Suite will be familiar to Seabourn regulars. There is a wide entry hall that runs down one side with a vanity area and makeup mirror. A luxurious marble bathroom and a walk-in closet are also both accessed from the hall. The living space has two different zones. There is a bedroom at one end as well as a spacious sitting/dining area at the other with floor-to-ceiling glass doors that lead on to the fully furnished veranda. The living space is sophisticated and elegant. It was created by the acclaimed designer Adam D. Tihany who’s also been responsible for the decor of some of the worlds finest hotels. Tihany used a soothing palette of cool blues and creams, accented by dark wood fittings and chrome highlights for a really smart finish. The veranda suite on Seabourn Ovation is elegant and spacious. This wonderful living space has two distinct zones: A zen-like sleeping area as well as a tastefully decorated sitting/dining space. In the sleeping area you can choose a queen or twin bed setup. The mattress is very comfortable and you can also select either a duvet or blanket, depending on the climate. A hand-crafted leather bedhead and dark timber inlays frame the bed. There are also ornate lamps as well as multidirectional reading lights. On each side of the bed are nightstands with cleverly designed split-level drawers to store reading glasses or other little items. Also, there is a special book compartment for bedside reading material. Clever split-level drawers and bedside book compartment. Another thoughtful addition is the bedside power unit with European and US points as well as a handy USB slot for charging your mobile devices. The useful bedside power unit lets you charge any device. Separating the sleeping and sitting areas are two unobtrusive, dark wood cabinets. These provide a visual divide between the spaces – one contains the mini bar while the other houses the entertainment unit and provides extra storage space. Even here the smallest details have Tihany’s touch, like the unique chrome cupboard handles. Tihany’s designer chrome cupboard handles. Tihany’s smart decor makes the sitting area in the Seabourn Ovation Veranda Suite seem even more spacious than that of the Odyssey-class ships. A plush sofa sits on one side, while on the other there is a glass-topped dining table and hand-crafted leather chairs. The ottoman converts to a smart coffee table. Another clever design touch is the ottoman which doubles as a coffee table. The top flips to reveal a dark wood tray. There’s is also storage space inside the ottoman. I think the highlight of the Seabourn Ovation Veranda Suite is the spacious veranda itself. In fact it’s the perfect place to relax and there is plenty of room for the outdoor furniture that includes a table, armchairs and ottomans. It’s also worth noting that every veranda is very private. Seabourn Ovation’s spacious verandas really impress. It is worth nothing that the verandas on deck 5 are partially enclosed. So rather than floor to railing glass they are part metal, part glass from floor to teak rail. Also, unlike the Odyssey-class ships the veranda is not genuine teak. Rather it is faux-timber, common to the pool decks of less luxurious ships. The hotel-style bathroom in the Seabourn Ovation Veranda Suite has genuine wow-factor! It sparkles with beautifully crafted chrome fittings and gleaming white and dove grey marble. Hotel-style bathrooms in every Seabourn Ovation Veranda Suite. There is lots of storage space around the double vanity. There is a full sized tub as well as a separate shower with a tight fitting glass door so there are no pesky leaks. In addition, there are large double vanities and plenty of storage space around and below them. Molton Brown bath products made exclusively for Seabourn. Hermès and L’Occitane soaps are included in initial bathroom setup, but your stewardess will replenish these with Molton Brown spa products made exclusively for Seabourn. There is plenty of storage space in the Seabourn Ovation Veranda Suite too. A walk-in closet has hanging space for at least two cases full of clothing. There are also deep drawers as well as shelving for other personal items. The closet has room for two cases full of clothing. There is more storage space in the sideboard cabinet opposite the foot of the bed, as well as in the dark wood cabinets in the living space. It’s worth noting that the bed is not quite high enough to easily fit some large hard-shell luggage underneath. There are 267 beautiful Seabourn Ovation Veranda Suites spread over seven passenger decks, from deck 5 to 11. In fact decks 6 ,7 and 8 have the largest number of Veranda Suites with 50 to 64 suites on each deck. Positions of the Veranda Suites on Seabourn Ovation. A handful of Veranda Suites are located on decks 10 and 11 among a small group of Penthouse Suites. I recommend these for a greater sense of exclusivity. V1 – V4 category suites are located forward or on lower decks, while V5 – V6 have preferred midship or high deck locations. The more expensive V3 – V6 category suites feature all-glass veranda railings from floor to teak rail, but V1 – V2 category suites are part metal, part glass from floor to teak rail. V1 and V2 category suites have part metal, part glass railings. Writing desk as well as personalised stationery. Suite number reviewed: 851 (identical to suite 848). The author sailed as a guest of Seabourn.